Benarasi Hues! is an event that took place between 30-Nov--0001 and 15-Sep-2004 in Hyderabad. When the flavors of Benaras come visting, there just has to be celebration! With or without a reason. Woven in brilliant hues of color, vivacity and art, these saris are enough to please a lady (there are always diamonds if that doesn't work, though!). Pitambari now has an offer that is hard to resist. Beautiful Benarasi saris at a 10% discount! 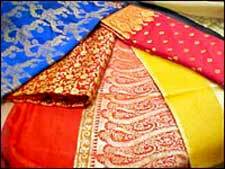 Find exotic benarasi work in fabrics like chiffon, georgette, silk and crepe among others. And hurry! You don't wann let the other lady get to it first! Please call the store at 2341-2173 for more details. USER REVIEWS FOR BENARASI HUES! Be the first to comment on Benarasi Hues!! Just use the simple form below. fullhyd.com has 700,000+ monthly visits. Tell Hyderabad what you feel about Benarasi Hues!! Meri Jaan, Sunday Ke Sunday!